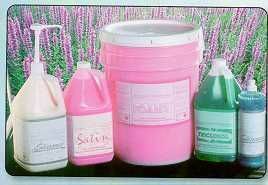 FOAMY: A pink lotion liquid soap designed for use in most commercial or public washrooms. 15% solid content, mildly scented bubble gum. SATIN: A thicker version of Foamy. Mildly scented sea spray. TRICLOSOL: A green lotion liquid anti-bacterial soap. 18% solid content. Scented almond. ELEGANCE: A pearlesced white lotion gel, hand and body soap. Mildly scented with sea spray. 18% solid content. POT SHOT: Acid based toilet bowl cleaner, mint scent. WHIZZ: Non-acid toilet bowl cleaner, potpourri scent. 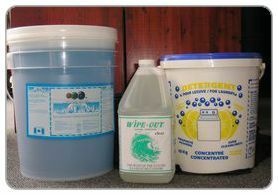 BLUE WAVE: Liquid laundry detergent for commercial use. Phosphate free. Not for silk, wool and non-colourfast materials. 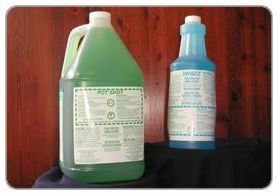 WIPE OUT CLEAR: All purpose cleaner proven to be an excellent spot and stain pretreat. NOTE: Custom blends of all hand soaps are available in minimum orders of 200 litres. Customers can order in other colours, scents & viscosity levels.